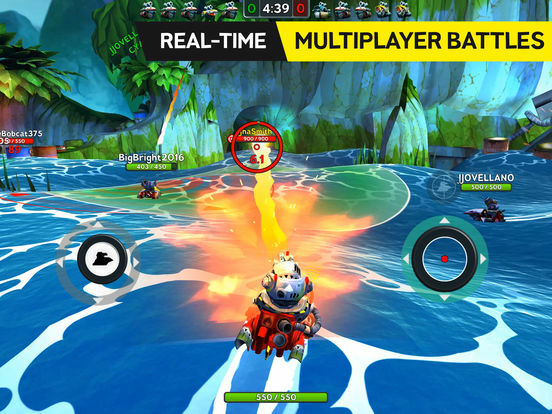 Battle Bay tosses you onto the ocean with a team of four other players as you all (preferably) work together to reduce the other team of five to wreckage. It's fairly straightforward overall, but there is a bit of nuance to it. You're going to want to improve your ship if you want to stay competitive. Once you meet the requirements, you can upgrade to improve stats and even add new slots for equipment. Different categories of equipment are designated with different colors: red for guns, blue for engines, etc. This makes it easier to tell what you can attach to which ship class. Upgrading improves performance, naturally, and will do everything from increasing damage to speed depending on the part being tweaked. Everything you can attach to your ship can be upgraded by spending Sugar and Parts, both of which are earned by playing but parts can also be gained when you scrap unwanted gear. Don't forget about your crew. As your captain level improves you'll be able to train the crew you've hired to give them all sorts of helpful passive talents. There's a bit more to a match than just moving around and firing cannons. You can tap an enemy ship to automatically target it, which is far easier to manage than manually moving the camera and crosshairs with the right virtual stick. Once the targeting reticule turns green, you know you're in range and your selected weapon is ready to fire. Weapons take time to recharge once they've been fired, but if you have more than one you can switch to others while the one you just fired is reloading. Waves can block your shots if you aren't careful, so try to plan around their movement. Mortars do less damage the further away you are from the center of the blast. If you see a large red target appear near you ship, either steer clear or try to get away from the center. Even as someone who usually detests competitive online-only multiplayer games, I have to admit I've been having fun with Battle Bay. It's not very complex, but there's a fair bit of leeway in terms of the ships you use and how you can improve them. The online requirement is a bit annoying, but it's fine if you know what you're getting into. Despite what you might think, I didn't actually have any prior knowledge of Battle Bay before i played it for the first time. I knew it was an action game that had to do with ships on the ocean, but that's about it. Had I known it was a multiplayer-only game of team deathmatch there's a good chance I, well, wouldn't have given it a chance. But I didn't, so I did, and I've actually been having a good time with it. I suppose there's always an exception. Battle Bay doesn't waste any time before getting to the tutorial bits. ordinarily I'd consider this a good thing, but as someone who tends to avoid online multiplayer games with strangers I was kind of hoping for an offline training mode or something. Instead I found myself getting forced into several online matches back-to-back, with only the briefest of respites in between so that the game could tell me to open a menu and do a thing. To be honest the online play instead of a more traditional tutorial wasn't that bad - which may or may not correlate to how I sort of MVP-ed several of those early matches - but I wasn't a fan of the hand-holding through the menus. It's just the typical 'go here and tap this' unhelpful tutorial noise that so many games often default to, which only serves to show players that a thing can be done and not WHY it's important for said thing to be done. Fortunately the arduously limited introductory segment ended after something like three to four matches and I could finally explore the rest of the various menus' options at my leisure - and that's a much better way for me to learn what does what and why. Though I will say that at least learning how to control the ship was pretty straightforward. Movement can be tricky since it's not automatically oriented to where the camera is pointing, but once I got the hang of it things went pretty well. Tapping on an enemy ship to target them instead of using the attack button to prep guns and move the camera is actually a huge help. And from there it's all a matter of high seas combat and ship upgrades. 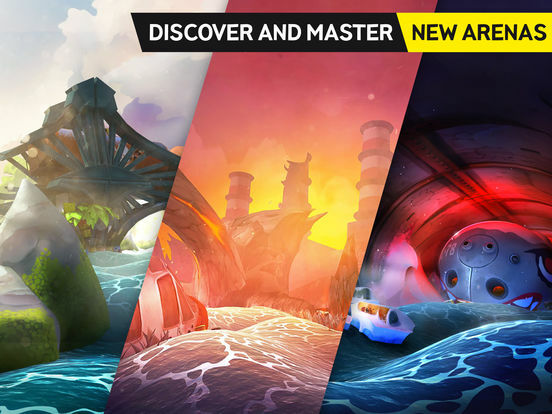 The in-between match stuff is likely what will keep you invested in Battle Bay, should you decide to give it a try. There are several ship types that you can unlock and purchase, and each one is outfitted for a slightly (or sometimes much more than slightly) different equipment loadout. On top of that, the gear you attach to each ship can be upgraded using scrap and other parts earned from matches. There are ever a bunch of crew members you can hire and train in order to unlock different talents for passive boosts to things like specific types of weapon damage or improved performance for a certain category of ship. And finally, yes, there's the multiplayer. Despite my initial reservation I do think it ends up being pretty entertaining. It's wild enough as a 5-on-5 free-for-all that it's rarely ever boring, but due to things like the terrain, constantly moving waves, and cannons needing to recharge before firing it isn't so chaotic that I can't follow what's going on. That's a tough balance to strike, honestly. All of my matches so far have also been smooth, with no lag from what I could tell either on wifi or when using a 4G/LTE connection. Even finding a match (which, remember, requires nine other active players) doesn't take long. I think the most I've had to wait from hitting Battle to seeing the match start timer was a little less than ten seconds. Of course the online thing, even if it functions well, has its own inherent problems. For one thing, the need to play against other people means you can't play offline. Like at all. It won't even load up the main menu if you aren't connected. That's not so great for mass transit commuters. The other problem is that you can't pause the game. I mean I understand why you can't pause, but that still stinks. I've never been a fan of games that can't pause - though at least the matches tend to only go for a few minutes at a time. 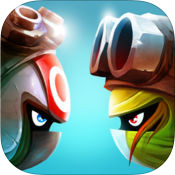 I ended up liking Battle Bay a lot more than I expected upon finding out it's an online-only team deathmatch affair. It plays well, the online functionality is solid, and it's honestly pretty fun to toddle around the waves taking pot shots at anything with a red health bar. So long as you're okay with the online-only requirements I'd say it's something to consider.